These remains are just south of PR-2 between Yauco and Sabana Grande. When located on a map, they barely lie within the municiaplity of Guanica just a few meters from the boundary with Sabana Grande. 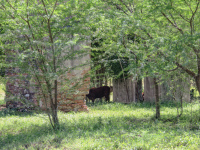 They lie in what today is cattle farm "Finca Vista Hermosa"where an employee there told us the ruins are of what was the Ingenio Antongiorgi. This Ingenio has sometimes been identified as Amistad, in operation by 1850 belonging to the Vivoni family. We verified this statement to be incorrect with a member of the Vivoni family who was born at the Hacienda Amistad. The Vivoni family member verified that this hacienda was owned by the Antongiorgi family and that these ruins had at no point in time any relationship to the Vivoni's. Amistad was Southwest of the town of Lajas off of PR-116. Though the particular member of the Antongiorgi family that owned this property is unknown to us at this time, the Antongiorgi family also had ownership in Hacienda Florida and Hacienda Maria in nearby Yauco.